As we noted last year, the footprint of I-980 has been included for study in Plan Downtown Oakland. Emily Glavey, planner at Dover, Kohl & Partners updates us on their efforts. Together, City staff and members of the community are considering the future of I-980. The following describes many of the key concepts and ideas being discussed. Each idea will need to be studied and analyzed further; however, this is an important initial conversation to determine a consensus-based vision for the coming years. From the start of the Plan Downtown Oakland project in the fall of 2015, the idea of re-imagining Interstate 980, the present day highway between West Oakland and Downtown, has been a popular topic. Several members of the community and a variety of stakeholders have discussed transforming the highway into a multiway boulevard. Led by the work of ConnectOakland, citizens and stakeholders have discussed a new vision for the imposing freeway, including new affordable and market rate housing, office buildings, public parks, cultural spaces, neighborhood retail, and adequate space for all modes of transportation. The impact that these changes can have on Downtown’s neighborhoods has generated great enthusiasm throughout the planning process. Interstate 980 currently divides West Oakland from Downtown with high-speed traffic and limited pedestrian crossings. Finished in the 1980s, the freeway was originally drawn up as a way to connect to a second Bay Bridge to San Francisco, but that bridge did not materialize. More than 40 acres of city blocks between Brush Street and Castro Street were demolished to make way for the new freeway, and West Oakland was cut off from Downtown. Today, I-980 carries only a fraction of the traffic it was originally designed to handle, and much of the downtown grid is cut off by the freeway. With few east-west connections, there are few options for pedestrians and bicyclists making their way across. Several of the key ideas discussed so far are included in the Downtown Oakland Specific Plan: Plan Alternatives Report (available at the project page) and are summarized below. 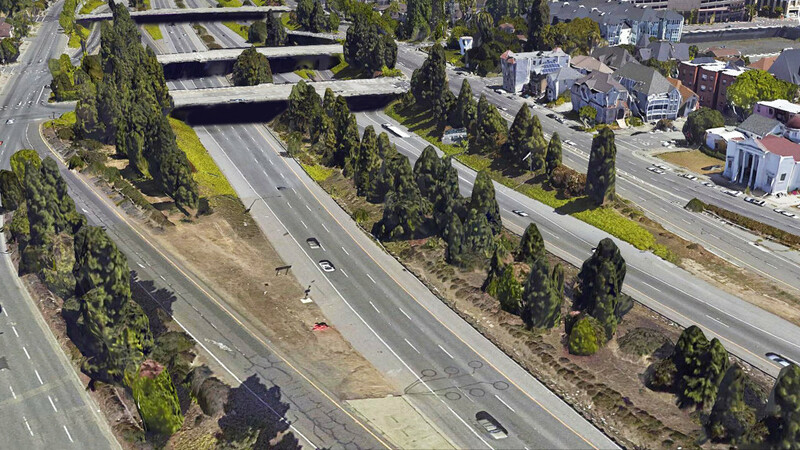 A reimagined I-980 corridor should be part of any conversation about the future of the Bay area and about what transportation options should be given priority in a future of evolving technologies. The Embarcadero and Hayes Valley in San Francisco have already seen a rebirth of their neighborhoods following the removal of freeways. Oakland has the opportunity to reinvest in its downtown neighborhoods in a similar way. The current freeway generates no economic development or revenue from its land use. This results in noise and pollution from high-speed through traffic – not tax revenue and job creation from new buildings and local streets with improved access. The swath of land that is I-980 can be replaced with an attractive, walkable and bikeable surface boulevard that accommodates traffic and takes up a fraction of the land. The remainder of the land can be used to recreate a new set of blocks for both public spaces and appropriately scaled development with a mix of market and affordable housing units, office and retail spaces. These new development opportunities can help reconnect West Oakland with Downtown, and provide a relief valve for new housing demand in the Oakland area. Streets that were previously cut off by the freeway can be reconnected across the new boulevard, giving West Oakland access to Downtown’s amenities and jobs. The I-980 corridor could also possibly serve as the alignment for a second trans-bay crossing for BART, CalTrans, and possibly high-speed rail. These additional rail lines are of unique regional significance, and can all be laid underneath a multi-way boulevard on the I-980 corridor. Having additional transit options would also encourage additional density along the Boulevard. Low to mid-rise buildings would gain additional height and intensity, providing housing and ground floor retail space at the heart of the city. Having readily accessible transit would allow additional affordable and market-rate units to be built with little or no additional parking. 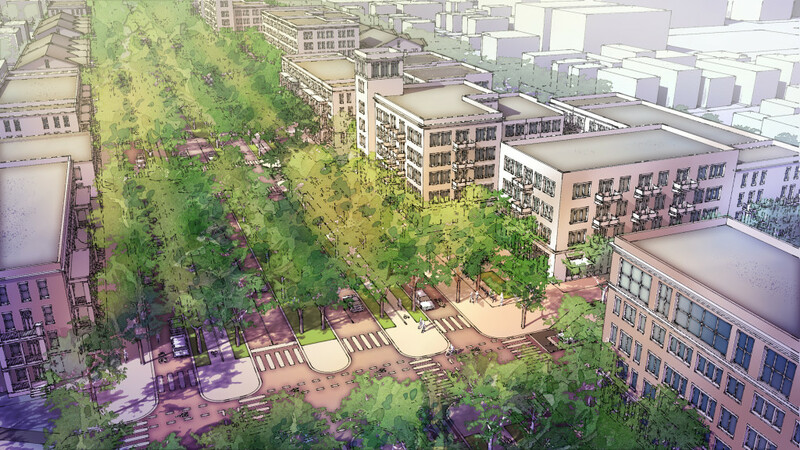 The transformation of I-980 can be a catalyst for walkable, mixed-use development. Small blocks of 220 feet by 200 feet would provide multiple crossings and intersections, further encouraging walkability. A mix of low-rise and mid-rise buildings with doors and windows facing the street could create a safe environment that can foster a memorable and creative urbanism. A carefully designed multi-way boulevard is an asset that benefits all users. 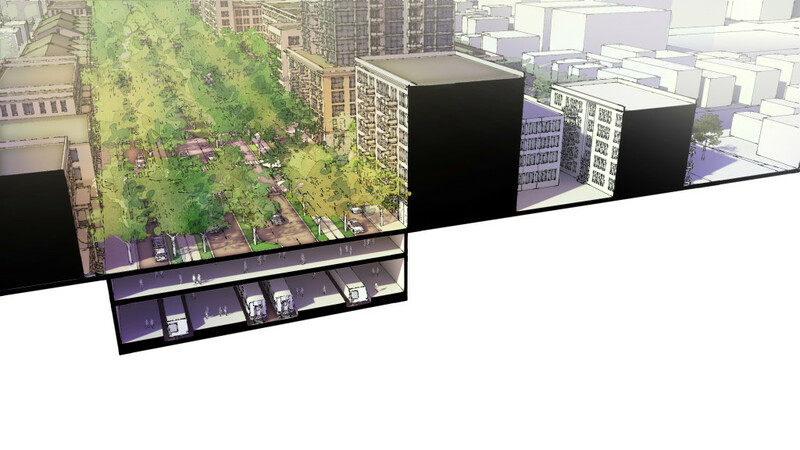 A multi-way boulevard is a unique street type that would accommodate both local and existing through traffic, provide parking for businesses and residents, and support generous accommodations for walking, biking and transit. The center of the roadway is envisioned to have two lanes in each direction for through traffic with a central tree-lined median with left turn pockets. Local traffic would be separated from the through traffic lanes with wide treelined medians. These side medians allow for separate paths for biking and walking lined by a double row of trees. Each side access lane has one narrow lane of traffic that is used to access a row of parallel parking spaces. The side access lanes here could be designed to flow in a clockwise direction to avoid some of the conflict points typically associated with multi-way boulevards. As an added benefit, bikes would be able to travel in both directions on both sides of the boulevard using the side medians to travel in one direction and the side access lanes to travel in the opposite direction. Converting Interstate 980 in Downtown Oakland to a multi-way boulevard would have a tremendous positive impact. By reducing the right-of-way dimension and designing the thoroughfare as a boulevard, more housing, commercial, office and institutional space could be added in a key location downtown. This would greatly contribute to the supply of housing and commercial space, and could have economic benefits for the City. The opportunity to include an extension of the BART system under the boulevard will also need to be carefully analyzed and evaluated. The potential for new development here that improves the public realm and furthers plan goals is great; attention will need to be given to the details, such as specifying the urban form (defining areas of intensity as well as areas where buildings should step down to meet the scale of surrounding neighborhoods) and including provisions for affordability, mix of housing types, and variety of uses.